Great starter or retirement home located in an excellent neighborhood, walking distance to the downtown core. 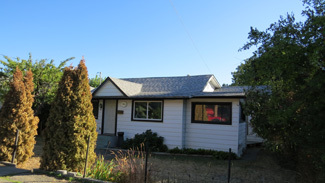 Rancher with three bedrooms, including a large master with sliding door to private deck. Spacious living room with laminate flooring and built-in shelving, sitting area off the living room could be used as an office or den. Bright, open kitchen and eating area looks out to the private backyard. 4-piece bathroom with claw foot tub and separate laundry room off the kitchen. Excellent backyard is fully fenced with alley access, storage shed and parking for two vehicles. Fence can be opened up to accommodate an RV. Newer roof, natural gas forced-air furnace and hot water tank was replaced last year.